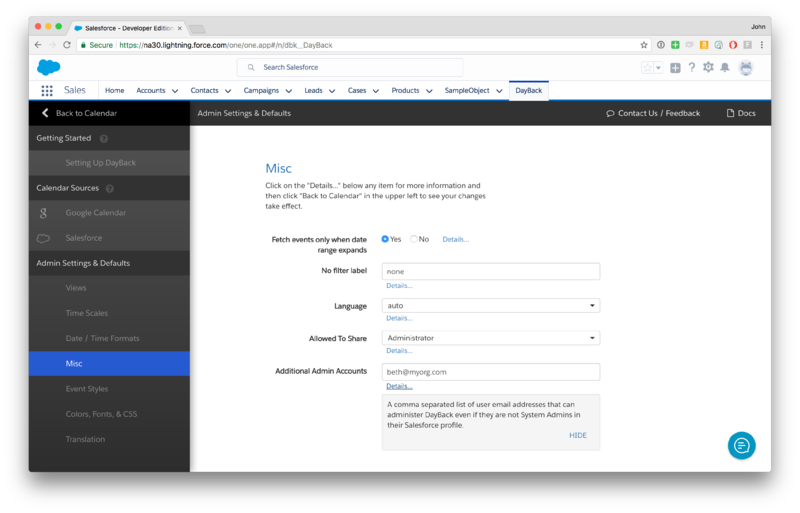 If you created your own DayBack Online account you're already an administrator and clicking on "Settings" in the calendar's left-hand sidebar will reveal an "Administrator Settings" button that will let you configure your calendar. You can also get to the admin side of DayBack by clicking "Admin Settings" in the 3-dot menu in the upper right of the calendar. How do I become an administrator of DayBack? There is no user administration inside DayBack for Salesforce: DayBack picks up the user roles and permissions you've assigned in your Salesforce org. That's how you decide which users can see DayBack and who's an admin: folks with a "System Administrator" Salesforce profile are considered DayBack admins. DayBack admins can add new sources, map to your custom objects, change default settings for your group. Of course, you'll need someone who is already an admin, likely someone with a "System Administrator" Salesforce profile, to enter these email addresses for you. If you can't raise anyone in your org who has access to DayBack and a "System Administrator" Salesforce profile, please get in touch and we can create a DayBack admin for you. 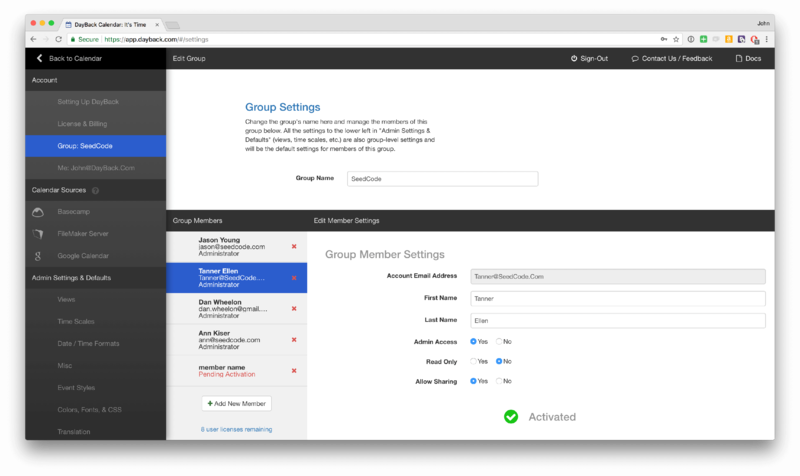 Administering users in FileMaker sources is done using the "Groups" section as described at the top of this page. Note that DayBack respects your FileMaker access privileges so that if a user's not allowed to see or edit a record in FileMaker, they won't be able to see or edit that record in DayBack either.